“I hope the rest of you will join me in using this particular wait times app. Even the interface for inputting a recent wait time is intuitive and actually kind of fun." 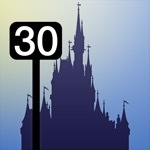 "It will be the most valuable of all the WDW apps. Planning ones day is the biggest challenge anyone runs into in the parks. A few missteps can waste valuable hours." Attraction wait times for Disney World covering the Magic Kingdom, Epcot, Hollywood Studios and Animal Kingdom. This app has a 4.0 star rating (965 ratings). It occupies the 21271th position in our ranking with 75 points. It is among the 1% best ones of its category and among the 1% best ones of the overall top.